Tom Stephenson was an Industrial Designer that started the United States Toy Train Company (USTTC) as a sideline for fun. The company produced tinplate 'O' scale trains and prints for buildings and layouts. They also made a few HO scale cars and accessories, but 'O' scale was the primary gauge that USTTC products were built in. Tom Stephenson was the owner and president of TESA Design, a company that specialized in transportation design for such clients as Amtrak, Pullman Standard and various regional transit authorities. His production design credits included Amtrak Turboliner trains, Washington, DC, Metro commuter trains, the San Francisco Bay Area 'BART' commuter trains, People Movers for the Bronx NY Zoo, Honolulu's DOT Transbus, dozens of special vehicles for commercial and recreational markets and hundreds of consumer products. He was also an avid toy train collector. He launched USTTC in the early 1970's, with first production taking place in 1974. The philosophy of the company was to create classic style tinplate trains that would operate on 'O' or 'O-27' track, but employing new designs, not reproductions. USTTC was located in San Diego and at 424 Seventh Street in Del Mar, CA 92014. Initially, Tom Stephenson had approached and met with Lionel MPC product development executives and engineers in Mt. Clements Michigan during 1971 to discuss new product ideas for toy trains. As a toy train collector and a designer of real prototypical modern era transportation means, Stephenson was excited about the prospect of translating the 'real' into the 'amusement'. Unfortunately, Lionel rejected Stephenson's ideas and suggested that since the market for specialty items such as those proposed by Tom was so small, that he should consider manufacturing them himself. He then decided to do just that. The first products issued were a series of 'O' gauge boxcars, a US Army loco, and various other locos as kit or ready to run. USTTC freight cars were brightly painted tinplate reminiscent of the Lionel #800 series freight cars from the pre-war era. The USTTC freight cars were designed to complement and run in consists with trains manufactured by the likes of Lionel, Ives, Dorfan, and American Flyer prior to 1940. The USTTC freight cars featured metal trucks, steel hook/latch couplers, metal wheels, brass journal boxes and steel axles. The USTTC box and stock cars were equipped with sliding doors. The Lionel style latch couplers were used to facilitate mating USTTC freight cars with the thousands of existing locomotives and cars. For Tom Stephenson, the tasks of designing, die making, tool making, creation of graphics, and paint schemes came easily. The hard part was finding a market. He invested heavily in embossing dies for this project. As a test, he bundled up the first cars produced and took them to a small local train club meet. The reaction was overwhelmingly positive. Members and guests bought more than $1,000 worth of boxcars and Tom signed on his first dealer. It was a small start, but USTTC was a small outfit with no intention of being competitive with the big manufacturers of toy trains. 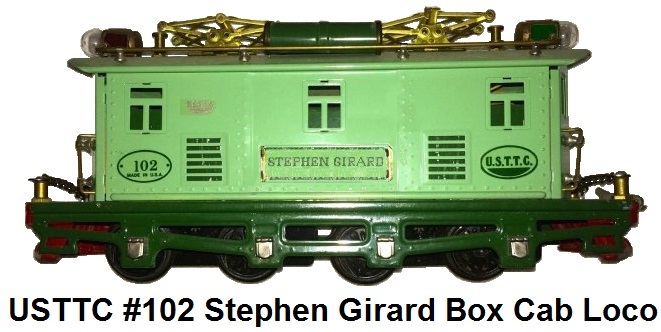 USTTC's box car design consisted of a 9" long by 2½" wide frame, a single brake wheel, door guides that only allowed the sliding doors to open to the right, embossed door handles, and applied graphics for the ladders, numbers and heralds. All USTTC trucks were black with seven embossed rivets, two embossed springs, and attached brass journals that were exact reproductions of Ives 'O' gauge journals. Unlike Lionel, the USTTC trucks were screw-mounted to the car frame. Box cars sold for $25 each. They were 4" high. The same 9" frame used on the box car was used on all other USTTC freight cars. All freight cars carried a 400 series number. Rubber stamping was also frequently used for numbering the cars. The #170 armored locomotive was USTTC's first offering in its motive power line. It was a steeple-cab design with twin swiveling gun turrets fashioned from Tootsietoy tanks mounted on the roof. It was painted golden brown like the other military freight cars, and had tinted 'bulletproof' windows and operating headlights on both ends. The eight wheels were driven by a pair of motors which could be manually reversed. The armored steeple-cab was sold only as part of a set that included three military flatcars. Car loads, including metal body trucks, heavy artillery pieces, and trailers and helicopters were Tootsietoys that were repainted by USTTC. Ceramic disc magnets held the miniature combat gear securely to the steel car frames and permitted fast removal for battle. No more than eighteen complete sets were sold. Three car sets of the military flats with loads were available for $68. A red #175 'civilian' steeple-cab also was offered with roof mounted airtanks and pantographs in place of the gun turrets. These were not part of a set, but were available as individual units. Approximately forty of the civilian locomotives were sold. The basic steeple-cab was manufactured by David O. King of New York and shipped in gray primer paint to California, where it was numbered either #170 or #175 with the addition of color, details, graphics, and window material. This locomotive was discontinued for a variety of reasons, primarily because of the difficulty of increasing the volume of this hand soldered, labor-intensive design. Instead of pioneering another new design, USTTC's second locomotive offering was a modified Lionel #8209 dockside 0-4-0T sporting a white pilot and boiler front. This stubby switcher was refinished in burgundy enamel to match the #424 Brookside Wine boxcar and #412 Brookside Wine Vat car. 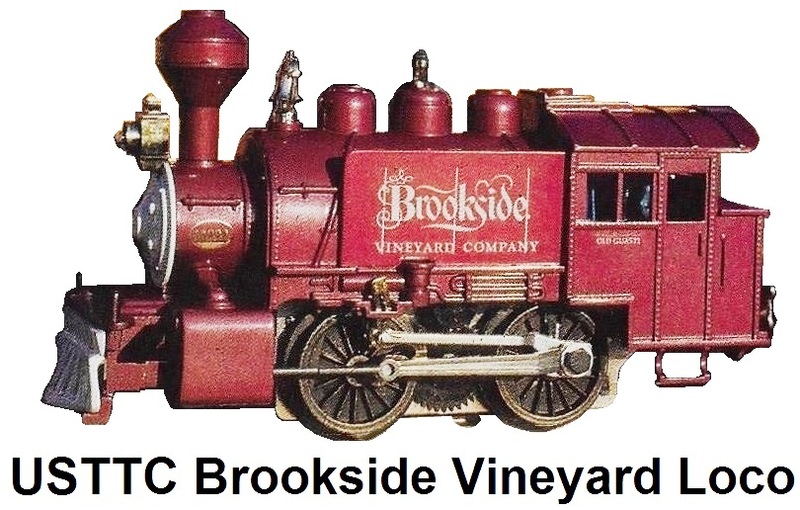 Both sides of the little tea kettle loco were decorated with Brookside graphics. Gold USTTC logos were attached to both sides of the boiler to resemble polished brass builder's plates. Small lettering beneath each cab window spelled out its name 'Old Guasti.' Guasti is a California town and home of the Brookside Vineyard Company. About 50 of these diminutive engines were reworked by USTTC and priced at $45 in 1976-77. Lionel stopped making the #8209 in 1976, thus ending locomotive supplies. The USTTC dockside loco was never given a USTTC number. All other locomotives bore 100 series numbers, except the powered streamlined suburban commuter trains produced later. Another reworked Lionel steamer was introduced about a year later. It was a heavy die-cast road engine with enough pulling power to handle a long string of heavy cars with relative ease. Using the Lionel MPC #8603 Hudson, USTTC applied a custom refinishing job that included a red lamp for achieving a firebox glow, glass cab windows, metal trucks, a weighted tender, jewel markers, Niagara type metal smoke deflectors, painted in gray and blue/white striping for the New York Central line, and detail trim. The locomotive detailing included stripes and a NYC logo on the Hudson's elephant ears with #160, stripes under the cab windows, and numbers on both sides of the headlight. The tenders were equipped with USTTC trucks, a latch coupler, and matching stripes plus New York Central lettering. A companion engine #160L, was identical except for its tender which retained the original MPC trucks with knuckle couplers. Only 46 were produced between 1977-78. The locomotive was equipped with a smoke unit, chuffing sound and an E unit. No whistle was included. A really different steam locomotive came off Tom's drawing board and became a reality in 1980 with release of the Eel River RR #112. It had a compact, powerful rugged look of the geared steam engine relics of old time lumbering days. From the 1880's until about 1960, three basic types of logging locomotives were used in North American forests: the Shay, the Heisler, and the Climax. USTTC'S model had a profile that was similar, although not prototypical. Let's say it looked enough like them to satisfy an average operator. Nothing exactly like it had ever been released by the large toy train companies, so it filled a gap and also appealed to those who like unusual items. The #112 ready-to-run locomotive made use of a new Lionel #8761 chassis and motor with a three-position reverse unit, working headlights front and rear, and was painted flat black with white lettering. The same outline engine was available in metallic tan with U.S. Army graphics as a #112MT to match USTTC's other military units. If you owned a Lionel SW-1 diesel chassis, you could buy a #112B locomotive body finished in black, completely decorated, and install it yourself. A #112K kit was also offered that included all body castings assembled except headlights and primed in locomotive black. Buyers of the ready to run locomotives were furnished with two of USTTC's #200 universal coupler clips, which was a small metal accessory device that facilitated mating of MPC knuckle couplers with pre-war latch-type couplers. And then came the #514 BART streamliner, followed by the Washington Metro set and #555 Interurban. While serving as director of design at Rohr Industries Inc., Tom Stephenson was in charge of developing the San Francisco Bay Area Rapid Transit (BART) system trains. USTTC's scaled down version mirrored the real train with its gleaming aluminum extruded bodies, deep tinted windows, dual head and tail lights, and articulated vestibules. The basic set consisted of a powered 'A' unit, a non-powered 'B' unit and a dummy 'A' unit, making a train length of 46 inches. Additional 'B' units were offered to make longer trains (approximately 50 made). All car interiors were illuminated and snap-out light buttons made bulb replacement simple. Each car had two trucks, the same type as on other USTTC cars, but minus the brass journals as found on some sets. By means of a spring loaded lift pin hidden on the vestibule underside, the cars were easily coupled or uncoupled. The BART sets were popular on the West Coast where the prototypes were well-known, but understandably, they were poor sellers east of the Rockies. About 200 BART A-B-A train sets were produced for one year in 1978 only. The BART set is powered by a Marx double reduction geared remote reverse motor, which allowed for smooth operation at slow speeds. There was a two-position directional control that permited either forward or reverse operation. The set was designed for 3-rail track using AC transformer power and performed well on Lionel three-rail tubular track and switches. The USSTC catalog number for the set was #514 and it retailed for $249.95. Extra coaches were $44.95. The car bodies were constructed of aluminum and the end pieces were cast resin hard plastic. The aluminum car bodies were 13 inches long. The detailed cast resin pieces added 1¼" to each end car. USTTC had purchased all remaining inventory stock of 700 assembled Marx motors from the Girard, Pennsylvania plant when then Marx owner Quaker exited the toy train business. The basic Marx motor was famous for never wearing out. Stephenson could not afford to purchase the actual motor tooling, which evidently was eventually sold to Soviet Russia by the British conglomerate Dunbee-Combex-Marx who had acquired Marx in 1976 from Quaker. Ron Darstein, owner of Colden Hardware Co. of Colden, NY, and one of the first USTTC dealerships, was instrumental in obtaining the last of the Marx motors for USTTC's BART/Metro commuter train sets. As a tribute, Tom Stephenson designed and made the #424NYC Colden Hardware box car, which was packaged with a matching scale sized set of nail keg loads. The Colden Hardware Company was located in an old mill and they sold cut nails and cast iron stoves, as well as Lionel, LGB and antique collectable trains. The following year, Tom worked up another design and in an effort to attract east coast buyers, went to work making the Washington DC, Metro set. The #500 Metro set was a three car set that featured the #500 powered A car, #501 B coach, and #502 dummy A unit. It was a replacement for the San Francisco Bay Area Rapid Transit (BART) 3 car commuter train set. It was now a representative model of the Metro rapid transit trains that ran in Washington DC. These sets were equipped with dual headlights, extruded aluminum anodized car bodies, chrome plated 18 gauge steel floors and vestibules, low center of gravity for high speed operation, illuminated interiors, and jeweled marker lights. Articulated vestibules facilitated operation on 'O-27' track. Like the BART sets, the Metro Set was powered by the former Marx motors. USTTC's 1980 product price list included a #555 Green Modern Interurban, motorized, priced at $110. However, none of these ever made it into the California company's regular production line. It was an item Tom said he intented to make using a few rejected BART/Metro bodies with scratches or blemishes in the highly reflective annodized finish. When these bodies were painted, those defects were completely hidden. The same Marx motor used for the BART/Metro trains was planned as power for this specialty item. Only a few samples were assembled before the company was sold. USTTC produced a few interesting accessories which included a passenger loading platform in three different sizes. They could be used individually, in multiples, or in combination with a station like Lionel's #115 or #116. In fact, the cream and red USTTC platform color was a close match for Lionel's stations. The 'half cylinder' dome design concept followed the typical depot architecture found in many American cities. It was open on both ends for through tracks or equally suitable for an end terminal arrangement. The domes were formed from a silk-screened design on unbreakable polycarbonate. Arched ends were of thermo-formed styrene, and the raised platforms inside were made of wood. Interiors were lighted, and a full color sign card with Amtrak and other symbols were included for optional use in decorating. Both the single and double-bay platform models were suitable for 'O' and 'S' gauges. A high clearance model was offered for Standard gauge or large scale trains. Other accessories included the #200 universal coupler clip that would adapt latch couplers to postwar knuckle types ($1.00); a set of eight nail kegs for use as extra loads; molded two figure sets of either soldiers (for military train) or railroad passengers/workers (for station scenery) and a latch coupler. While these are of some interest, accessory collectors should be on the lookout for the USTTC set of bookends which have a BART train emerging from tunnel portals. These bookends were made of cast urethane with a metallic bronze finish, and only 25 sets were produced. 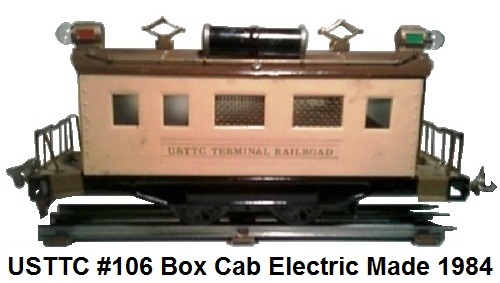 A #106 boxcab electric engine was produced in 1984, the same year the company was sold. Although, fifty each were manufactured in brown and in green to match the heavyweight passenger cars, only a dozen or so had been assembled at the time of the sale. Subsequently, all parts were shipped to the new owner along with the tooling and none were ever sold by Tom Stephenson to dealers or retail customers. The design made use of the USTTC 9 inch freight car frame as a chassis for a Marx double reduction geared motor, and the little engine had a perky look with its double headlights, pantographs, and air tanks on the roof, neat brass handrails, steps and ladders, plus bright red cowcatchers. An interior cab light softly glowed through translucent window material and four larger ventilation windows were protected by perforated metal screens. All in all, it was a delightful package to behold with a string of heavyweights in tow or just by itself. In addition to owning the Colden Hardware Company and being an avid toy train collector, Ron Darstein was also a professional architect, and was the designer of USTTC's heavyweight passenger cars. These cars resembled Lionel's #710 and #712 cars. Their length was 11½ inches, and they added on brass steps, two air tanks, and latch couplers. The USTTC car doors didn't swing open even though the doors are a separate stamping, and window material was printed to look like window frames. All of the passenger cars were equipped with the same type of four-wheel trucks as used on USTTC freight cars. One truck on each car had a Lionel type roller pickup to feed power to the single interior floor-mounted lamp. Observation cars had a formed brass platform railing typical of the prewar era. Three and five car sets of the heavyweight cars were offered in a brown and tan enamel combination with each car carrying the name of one of the five Great Lakes. Three and four car sets in a two-tone green finish were also offered. These cars were labeled for the USTTC Terminal RR and included the #520 'Liberty Bell,' #521 'Stephen Girard,' #519 'Dining Car,' and #522'Coral Isle.' It is believed that some color variations exist, such as three-car sets with green roofs, tan sides, green Stephen Girard graphics, and green trucks (approximately ten were made). There may be others, since all heavyweight passenger car parts were formed and painted by USTTC in California then shipped to Colden, NY, for assembly under Ron Darstein's supervision. Heavyweight cars with 'Colden USA' rubber stamped on the underside, have been found. This may have been done on items intended for export. The heavyweights all carried 500 series numbers as did other USTTC passenger units. Collectors whose interests are focused on uncataloged specialty items or oddball cars will be pleased to know there are some to be found in the USTTC line. 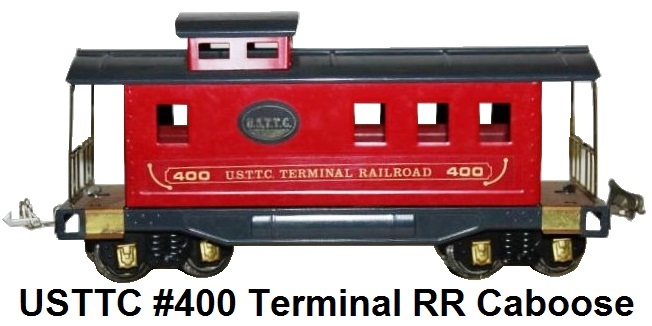 One of these is a specially made nickelplated dealer display caboose that was produced about 1977 to promote the new deluxe USTTC #400 caboose. These very shiny cabooses bore the same graphics as painted stock models and were fitted with an interior light, brass steps, and brass endrails. Some of the boxes these came in were marked '400N' or '400(N)'. However, this may have been done by dealers or subsequent owners to differentiate the special caboose from the regular production car. Only about fifty of these cars were fabricated and initially sold only to dealers. According to Tom Stephenson, at one time the Rich-Art Co. made stampings for him and they had about a dozen box car parts plated in chrome to show Tom the effect. This occurred in 1976, and in the following year the nickel-plated caboose was conceived and produced. But the boxcars were not intended to be for dealer display and the USTTC factory in San Diego never produced them. A unique #495 Rail Service car was made for, and marketed by Trains West of Denver, Colorado. It featured a regular USTTC boxcar body and doors, but had eight punched out windows. The roof, frame, and doors were painted dark red in contrast with a pumpkin orange body. The side graphics with gold and black lettering told the world this unit was "Radio Equipped." Both car ends looked very much like a Lionel #814, complete with brass ladders and brake gear. The #495 never appeared on a USTTC product price list. Some of the #495 Rail Service cars made for Trains West had blue window material installed and were illuminated. This variation of the car came with the same pumpkin orange body but had a silver gray roof and a black frame. The graphics applied to the left side of the car featured the Trains West logo and a small serial number while the right side (like the non-illuminated model) had the USTTC logo and a large #495. A couple of planned cars were designed to make use of the #495 body outline and these did get listed in promotional flyers along with a notation that availability was "to be announced." The #495MW Maintenance of Way crew car was to have interior illumination and be finished in gray and black, but only three samples were assembled. An illuminated #495MT Hospital car was also planned as an addition to the other metallic tan military series cars but neither of these two items ever went into production. Tom Stephenson had some additional freight car designs in mind that never became productized. One was a gondola which was tentatively numbered #455. He approved the final tooling about the time he sold USTTC in 1984 to Anthony Consoli and his friend, Ron Stanley of Toms River, NJ. They eventually made up some of these unlettered gondolas which were finished with burnt orange bodies on black frames. 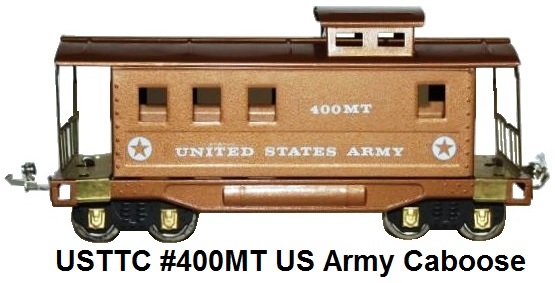 Tom also had plans to make a #475 covered hopper that appeared on a USTTC product price list, but none were ever made. In 1982, the Toy Train Collectors Society, headquartered in New York, sanctioned a limited edition stock car that was supplied as a kit by Colden Hardware Company owner, Ron Darstein, who was also a TTCS member. The car had a white body, red roof, and black frame. Lettering and TTCS logos were furnished along with an illustration of the proper way to decorate the car. It is estimated that about 120 of these kits were distributed, primarily to eastern collectors. A TTCS box car had previously been created in 1981. Additional TTCS cars were later made in 1983, 1985 and 1986 by USTTC under the new ownership. In 1984 a box cab locomotive was made too. So there is a complete TTCS freight train that includes a #1983 gondola, #1981 box car, #1982 stock car, #1985 flat car with lumber load, #1986 caboose, and #1984 box cab electric locomotive. At one time Ron Darstein toyed with the idea of creating a circus train using USTTC rolling stock. It is beleived that some sample cars were made like a box car, stock car, flat car, and a heavyweight passenger coach numbered #513, but exactly how many exist today couldn't be determined. Another specialty car that collectors may come across is a USTTC searchlight car that was made by Californian Steve Latta with Tom Stephenson's permission. About 125 commemorative cars were assembled for the Southwestern Division of the Toy Train Operating Society in 1978. The car had dual operating scarchlights that swiveled. The base was a USTTC freight car frame painted blue. A gold-lettered lighted panel with the TTOS commemorative information was applied to the car between the lights. The car was numbered 478SW. No regular production searchlight car was ever made by USTTC. A special box car, created in celebration of the Toy Train Operating Society's 1981 San Diego Convention, was probably the most unusual item to come out of the USTTC shop. It was just a basic USTTC boxcar. How it was finished made it quite different. No two cars had the same color combinations. Furthermore, no single car had the same color combinations when viewed from any side! While some colors were quite attractive, others were downright repulsive. An insert sheet that was placed in each box explained that the road name had to be "...our own San Diego & Eastern Arizona RR," and that the cargo was tequila. Humorously, it went on and told how the tequila somehow got into the water cooler at the USTTC shop, resulting in a series of rainbow-colored cars. Even the graphics included a touch of humor with an artist's rendering of a sleepy Mexican holding his cocktail glass in the shade of a Joshua tree, a recipe for preparing a margarita, and a very large 'Tequila' lettering along with the car's #427T. When the tequila car was unveiled and offered for sale at the TTOS convention for $30, it attracted a considerable number of lookers, but few buyers, so most of the 100 cars that had been made were returned to the shop unsold. When the company changed hands in 1984 and was sold to Anthony Consoli of New Jersey, the majority of these cars were repainted and given new graphics. Tom Stephenson later said that maybe twenty of the original tequila cars survived. Steve Latta of Nostalgia Train Works utilized USTTC freight car parts to create a series of 6 custom decorated club cars for TTOS Divisions during the early 2000's. These included a TTOS Hartford, Connecticut box car in 2002, a TTOS Phoenix, Arizona gondola in 2003, a Sacramento, California lumber flat car in 2004, a TTOS Southern Pacific Division stock car in 2005, a TTOS Portland Northern lumber flat in 2006, and a Southern Pacific caboose in 2007. Tom Stephenson passed away in 1989 and, with him, USTTC did as well. Although USTTC is no longer in business, their items can occasionally be found at train meets, on eBay or through one of the major auction houses. Since the sale of the company in 1984, the trains have become very collectable. Because USTTC only produced small quantities, finding the trains today has become a real challenge to collectors. The red, white and blue painted #454 Bicentennial box car was a sellout in 1976 and is highly sought by collectors. USTTC trains are easily identified by the black and white pressure sensitive adhesive logo applied to the underside of each car frame.